Contrary to the advice given in many gardening magazines and TV programs, the grass does not stop growing during Winter in our climate. Any mild spells see grass growing, albeit much more slowly than at peak times. One of the main secrets of a good lawn is to ensure the grass is healthy going into Winter, and this is where it is essential to feed in Autumn with a fertilizer that will provide the grass with the nutrients it requires to survive the cold frosty days, the heavy rain, or lots of snow cover. The autumn fertilizer should be applied around late September to early October. The best type of Autumn fertilizer is one that has a low Nitrogen content, as the last thing we need to do is to produce a soft lush growth which would be prone to damage by the elements, and also increases the incidence of disease, mainly Fusarium, which is rife in Autumn and can cause a lot of turf damage. On the other hand, Potassium should be applied at a high rate, as it hardens the grass thereby helping to protect against weather problems and disease. The other ingredient in the Autumn fertilizer should be Iron, both for the fact it also hardens the grass against the elements and disease, but is also a very effective moss killer. The ideal Autumn fertilizer will consist of four to five per cent Nitrogen, eight to ten per cent Potassium, and between six and eight per cent Iron. All fertilizers show the ingredients in the bag on the front, so look for an ingredient list close to the following. 4. 0. 8 + 8% fe (iron). The zero figure relates to Phosphate, which is not necessary in grass fertilizer other than in the initial establishment stage. There is a huge variety of different fertilizers from different suppliers, a lot of them very good, a lot promising all sorts of myth and magic, but if you follow my advice you will get good results without paying through the nose for unnecessary ingredients. Winter fertilizer is more about keeping the grass healthy, and moss under control, than about making grass grow. So for that the Nitrogen has to be very low, and Iron content high. Lawn sand has always been the default lawn tonic and moss killer from many suppliers in Winter, but many suppliers skimp very badly on the Iron content, meaning the contents look good value, but the low Iron content, mostly no more than two per cent, means that to get any real effect the dosage has to be high, which in actual fact means the Nitrogen level will be far to high. Applying a lawn sand at only two per cent Iron will have very little effect on Moss, and will not help grass much either, so I always use a lawn sand that contains around two to three per cent Nitrogen, with at least six per cent Iron. This mix will read on the label as 2. 0. 0 + 6 fe(iron). Get here. I would advocate applying this lawn sand two times over the Winter, once in late November/early December, and again in early February. 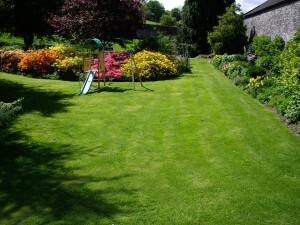 Lawn sand is easy to make, and can be more effective as you know exactly what is being applied. Dried sand with added iron at a ratio of one kilo iron, to five kilo sand, will give a very good effect. See here. If you follow this advice, along with the other maintenance practices I advocate elsewhere on this site, the lawn will come out of the Winter in good condition, ready to take advantage of the new spring growth. PreviousSeaweed, and Why it Should be an Essential Part of Fine Turf Maintenance. Seaweed, the Superfood – Fertiliser for Humans! To Turf or Seed Your New Lawn? A Quick guide. Hi Duncan , I have just ordered bowling green lawn seed and some seaweed,I’m in the process of overseeing my lawn . I will soon be starting autumn maintenance and I couldn’t find if you sold any autumn fertiliser. Can you supply or give me the name of one that will work well with the bowling green lawn seed. Hi Duncan, I’ve just ordered some bowling green grass seed and seaweed. I’m getting ready for autumn lawn maintenance and overseeing .